Cutters Module 0.8, 0.6, 0.45 The dimension for the 12 leaf pinion should be 0.429 not 0.465 as stated in the book. This clock should be useful project for anyone who has made at least one clock or for a model engineer who is considering making a clock as a diversion from models. It has been designed to meet the following criteria. Skeleton construction with a clearly visible and eye catching escapement . Use of a relatively short compound pendulum to give a stately periodic beat of 1.1/2 seconds. Clean uncluttered lines. A maximum height of 12". A duration of 8 days. All components to be capable of manufacture on a Myford ML10 or similar lathe. The escapement and compound pendulum are front mounted for maximum effect and to allow one to clearly how a gravity escapement works. The gravity escapement has been inverted from its normal layout to reduce the overall height of the clock when using a compound pendulum. 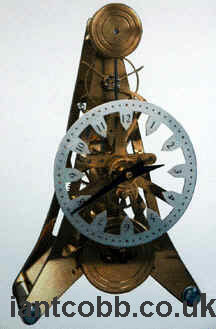 The clock was well received when it was displayed on Crafts for Four Seasons stand at The 1997 Harrogate Show.